Asset markets should now be in the final 3-5 days of this intermediate degree profit-taking event. We are moving into the belly of the beast, so to speak. This is that period of time during an intermediate decline where things start to look really bad. The media always confirms the decline with multiple stories of gloom and doom. Don’t be fooled though, this is just a normal profit-taking event and it happens like clockwork about every 20-22 weeks (although sometimes QE can stretch the cycle to over 30 weeks). 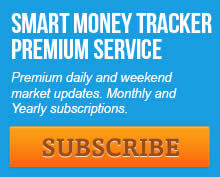 The stock market is now 19 weeks into its intermediate cycle, which generally lasts 18-22 weeks. So we are well into the timing band for that major bottom. The daily cycle is on day 35 which generally lasts about 35-40 days. So we are now in the timing band for that smaller cycle bottom also. Gold is 22 weeks into its intermediate cycle, which generally runs 18-25 weeks, and 19 days into its daily cycle which averages 18-28 days. 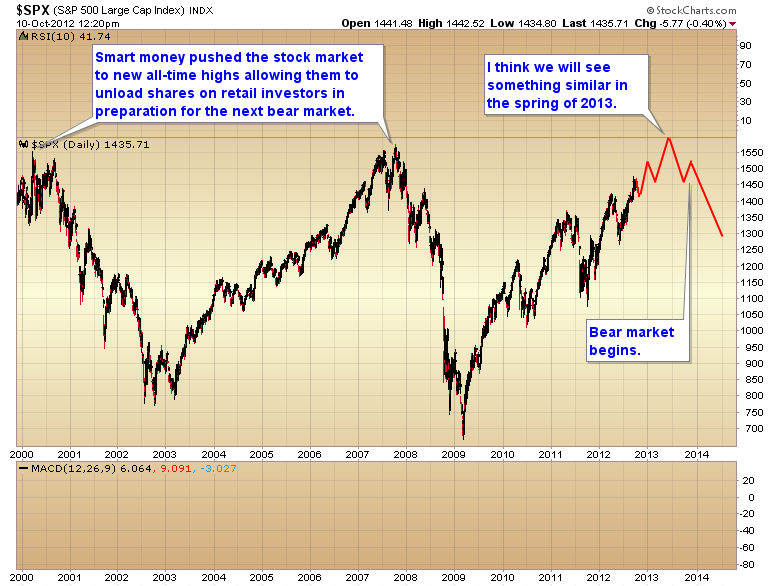 Considering that the stock market is right in the timing band for its cycle bottom we could see a bottom any day now. However considering that this current daily cycle was left translated (topped in less than 20 days), the market should move below the prior daily cycle low before bottoming. 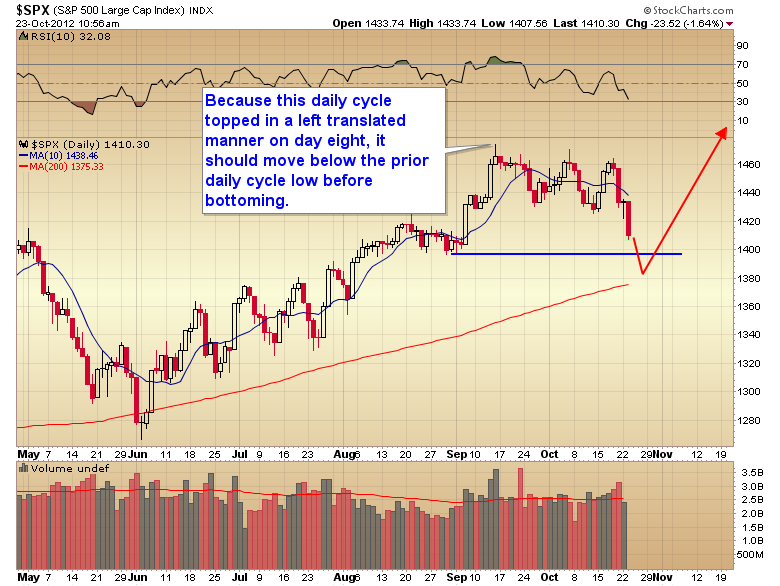 Left translated cycles generally form a pattern of lower lows and lower highs. 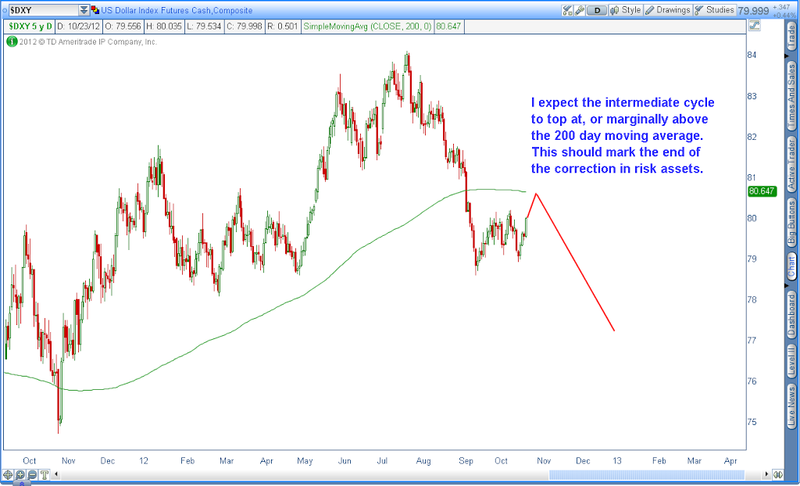 My best guess is that risk assets will find a bottom at about the same time the dollar tests the 200 day moving average. While I wouldn’t rule out a marginal move above the 200, I think it’s safe to assume that Bernanke has broken the dollar rally with QE3, and that any move above the 200 will be brief and roll over quickly. 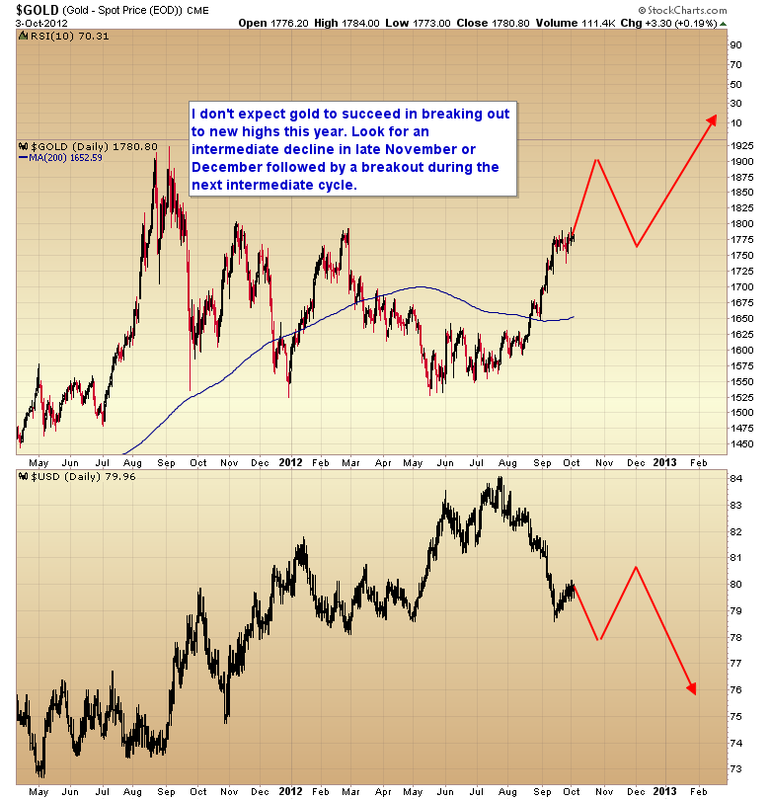 Once the dollar resumes the secular bear trend all asset markets should form intermediate bottoms and begin the next leg up in the cyclical bull market for stocks, and secular bull market in gold. For a more in-depth explanation of what is transpiring go to the SMT premium newsletter. $10 one week trial. This entry was posted in Uncategorized on October 23, 2012 by Gary. In my last article I warned traders that markets, especially gold, were at risk of a profit-taking event. 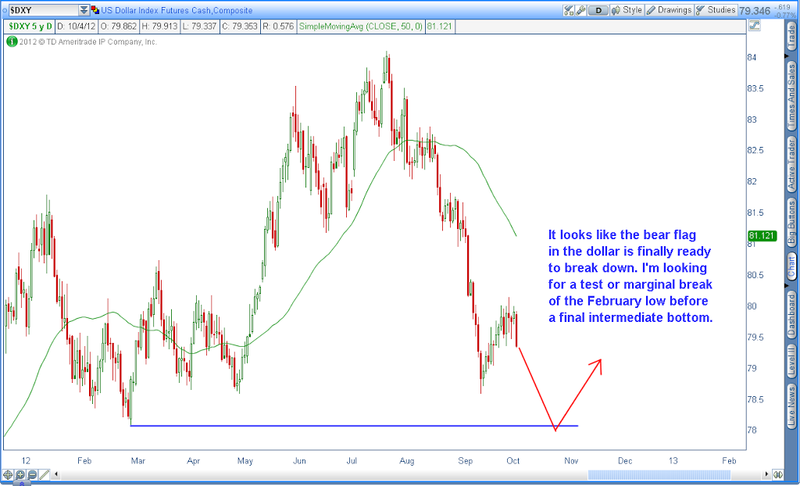 This was due to the fact that the dollar had found an intermediate bottom and begun a counter trend rally. I think the second stage of that rally is probably beginning today. I’m looking for the dollar index to test the downward sloping 200 day moving average before rolling over and continuing the secular trend. 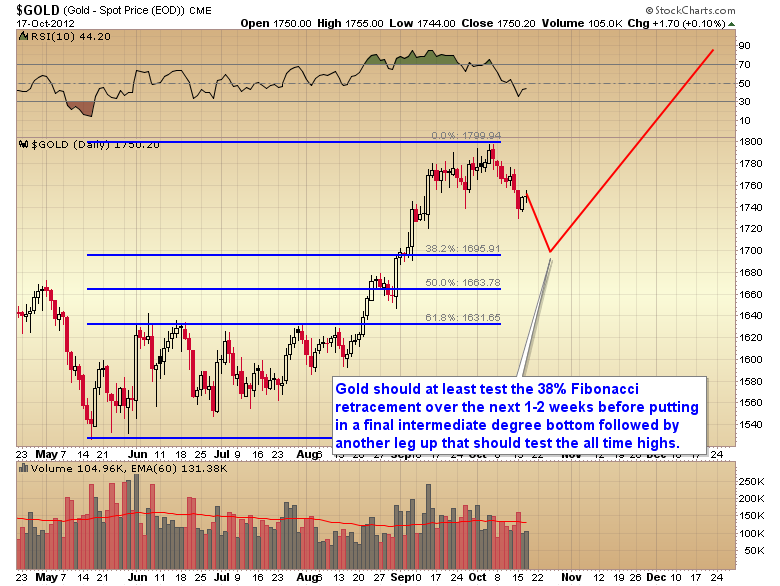 This should drive gold down into a final intermediate degree bottom. My best guess is that we will see a rather mild intermediate decline, probably only testing be 38% Fibonacci retracement. Since gold is already on day 15 of its daily cycle, and that cycle normally lasts 18-28 days, we should get a final bottom sometime in the middle to latter part of next week. If one were trying to time the exact bottom you could either buy when gold tags $1694 (the 38% Fibonacci retracement level), or when the dollar index tags the 200 day moving average. Either one of those events should be close enough to the bottom where any further drawdown isn’t going to be very significant or last more than two or three days. I expected the next intermediate cycle to be every bit as violent as the last one, and gold should make its first test of the all-time highs at or slightly above $1900 sometime before the end of the year. Because of the extreme undervaluation levels that were reached as the CRB put in its three year cycle low, mining stocks should be the big winners again during this next intermediate cycle. 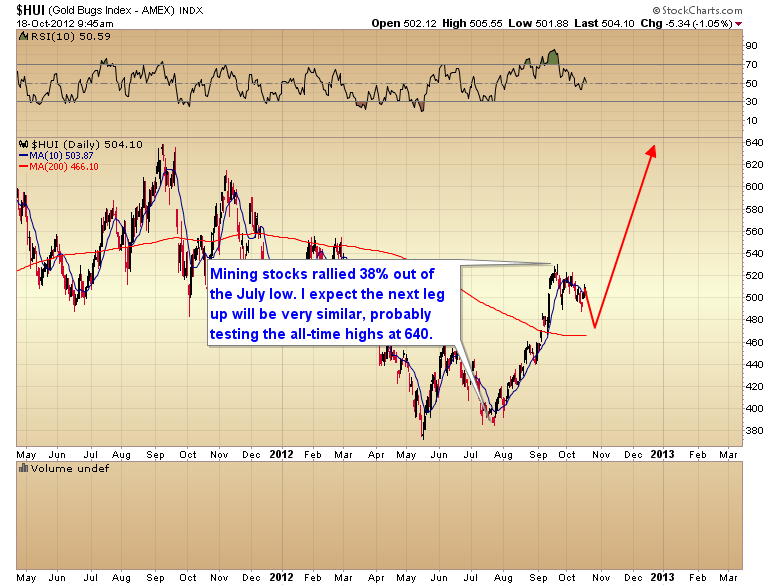 Just as I was expecting the HUI exploded out of that July bottom racking up a 38% gain in a little over two months. I think we will see something very similar during the next intermediate cycle and miners will test the all-time highs before the end of the year. The last C-wave that ran from the spring of 2009 till it topped in September 2011 was the C–wave of silver. Silver vastly outperformed all other areas in the precious metals group. This C-wave is going to be the C-wave of the miners. It’s already started with an initial 38% rally, and I expect by the time this C-wave tops in mid to late 2014 we will have witnessed a 300% to 500% gain in the mining indexes. Sometime next week traders will get their opportunity to jump on board what will almost certainly be an amazing ride over the next year and a half to two years. This entry was posted in Uncategorized on October 18, 2012 by Gary. Since the breakdown out of the bear flag on the dollar index hasn’t followed through, the odds now favor that the dollar has generated an intermediate degree bottom. First off this should be a countertrend move as I think the three year cycle has already topped. Based on the intermediate cycle count in the stock market the dollar probably doesn’t have more than 3-4 weeks before this rally rolls over and begins another leg down. Generally when an asset begins a bear market it will retest the 200 day moving average once or twice before the trend change is complete. With that in mind I think the dollar index will test and maybe marginally move above the 200 day moving average before resuming the secular trend. If the dollar has generated an intermediate bottom then this should be the timing band for stocks and commodities to move down into intermediate degree corrections (considering the strength in oil, energy may decouple from this process). Keep in mind this will just be a profit-taking event. I fully expect to hear many of the perma bears jumping on the bear market bandwagon at the bottom of this correction. We are going to hear many analysts claiming that QE3 didn’t work, that deflation is setting in, etc. etc. None of that will be true. This is just going to be a normal intermediate profit-taking event. They generally happen like clockwork every 20-22 weeks. Considering that the S&P is on the 18th week of its intermediate cycle, it is due for that corrective move, and now the dollar appears to be ready to cooperate by rallying out of its intermediate cycle bottom. Once this corrective move has run its course I expect we will see stocks rally, probably back to new highs. As a matter of fact I think the most likely scenario is that stocks will rally just enough to break the all-time highs, either later this winter, or sometime next spring. A move to new highs is usually what it takes to pull in every last retail investor allowing smart money to unload their shares that they have been holding for the last three years. This is how the last bull market topped also. I think we can expect a final bottom (if an intermediate decline has begun) either on the next FOMC meeting, or if the cycle stretches a bit, a bottom on or around the elections, once it becomes clear who’s going to win the presidency. We took profits on our mining positions last week and put in place a strategy to allow us to weather an intermediate decline in the metals if it is now in progress, while still maintaining some exposure if the bull surprises to the upside and tests $1900 before dropping down into an intermediate correction. This entry was posted in Uncategorized on October 10, 2012 by Gary. Generally speaking, I’m not one to put much faith in conspiracy theories. I don’t think the price of gold and silver is being suppressed by the government or the Fed. Our money supply is no longer tied to gold so there is no logical reason for the Fed to care what the price of gold is. No matter how high or low it goes it’s not going to affect the Fed’s ability to counterfeit dollars at will. Oil on the other hand I can see a very good reason to attempt manipulation. If the price of oil rises too high it stifles economic growth and will eventually trigger the next recession. During the last commodity bull market we have a clear history of politicians trying to impose price controls on energy, but no history of price control on precious metals. Over the next month rising oil prices might not be too kind to incumbent politicians. So I could see a logical reason to attempt suppression of the oil markets over the next month. 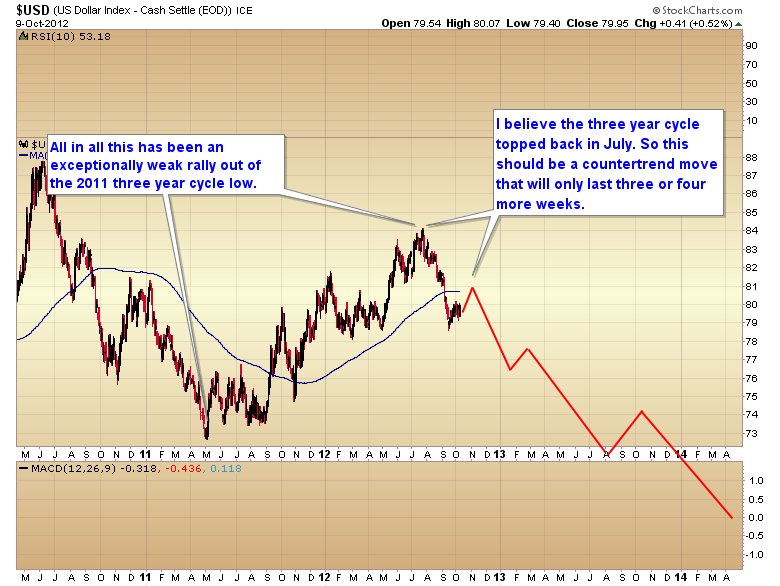 It is late enough in the intermediate cycle that yesterday should have marked a bottom for oil. If oil were to continue down for the rest of the month moving well out of the timing band for an intermediate bottom I could make a case for something fishy going on, especially if the dollar continues to fall during this time. However as most people already know artificially depressing price always has the opposite effect by creating too much demand. Eventually that demand overwhelms the attempts at manipulation and the asset or commodity will resume its secular trend at a much faster pace than would have occurred naturally. The opportunity is that if we see oil held artificially low over the next month, and well past the intermediate cycle timing band, to create a favorable environment for incumbent politicians, then we can expect an exceptionally violent snap back rally once demand overwhelms the manipulation. The trade would be to buy energy stocks or oil futures right after the elections if oil continues to remain in a downtrend into November. This entry was posted in Uncategorized on October 5, 2012 by Gary. It looks like it took till Thursday for the dollar to make up its mind. In my last post I was expecting a decisive move by Monday or Tuesday. After two weeks of frustrating back-and-forth action it looks like the bear flag in the dollar is finally ready to break to the downside. This should deliver one more leg down to possibly test or marginally break below the February low before forming an intermediate bottom. 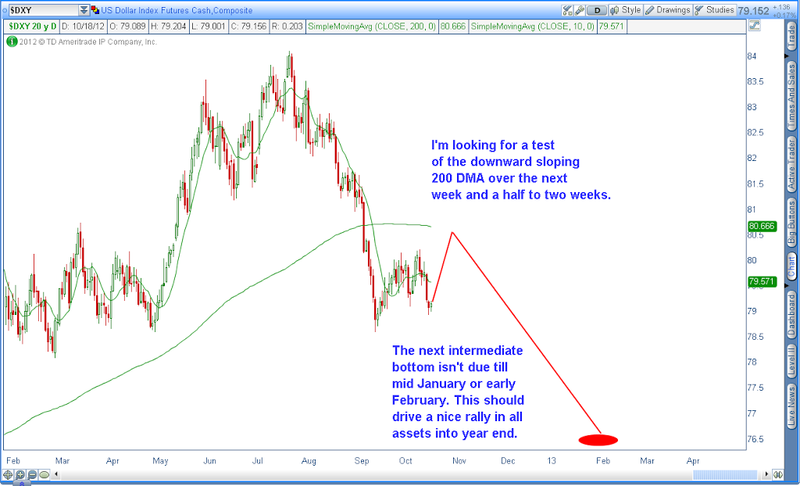 The next 2-3 weeks should be the best opportunity for gold to test $1900. Again I don’t expect a breakout to new highs this year and once the test occurs it should fail and be followed by another intermediate degree decline as the dollar rallies out of its intermediate cycle bottom. The breakout to new highs should occur during the next intermediate cycle sometime in the spring. This entry was posted in Uncategorized on October 4, 2012 by Gary.